The Relay for Life of Scioto County is this Saturday, from 6:00 pm – midnight at the Minford High School track. There will be a survivor reception at the event. The relay has been around since 1985 and Scioto County has been doing the relay for life since 1998. Relay For Life is a grass roots, community-based team event. The Mission of Relay For Life states it represents the hope that those lost to cancer will never be forgotten, that those who face cancer will be supported, and that one day cancer will be eliminated. At Relay For Life events, no one faces cancer alone. We come together every year at more than 3,500 Relay events around the country to support and celebrate survivors and caregivers. Opening Ceremony – Time to get started. honors everyone who’s been affected by cancer and everyone who has contributed to the success of this year’s Relay season. Survivor/Caregiver Walk Survivors and Caregivers are the heart and soul of Relay For Life events. Honor their strength and courage with every step they take. It doesn’t matter if you were diagnosed 10 days ago or 10 years ago, you can walk while everyone gathers together to cheer you on. Luminaria Ceremony – This ceremony represents everyone touched by cancer with a Luminaria. Each light represents a life—a life taken by cancer, a survivor of cancer, or a support for a person still fighting the disease. It’s a powerful demonstration that gives people the opportunity to grieve but also offers comfort and hope. Every Dollar Makes a Difference at Relay For Life, no donation is too small, each and every dollar counts. Donations help fund groundbreaking cancer research, patient care programs, and can make a difference in communities. With every donation, you are helping the American Cancer Society save lives. 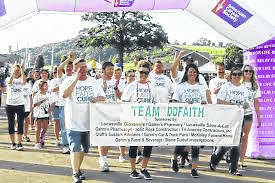 On the Scioto County Website they have listed the following: “We’ve raised $2,225.50 Our Goal is $50,000.00. Once again, all survivors, caregivers and all who want to see what this event is all about, come out to the Minford High Track on Saturday evening 6/16/18 from 6 pm to midnight.